Creating enticing game art can mean the difference between getting a game published or rejected. This book is ideal for many, including beginning art students who wish to learn the fundamental techniques used in creating concept art for game design and artists looking for a new challenge. Readers will learn how to create game art and design clear, concise storyboards as well as how their art is used in a game design document. This book will appeal to today's artists looking for challenging outlets for their creativity and artistic skills. Traditional artists and animators have flocked to the field of game art upon discovering that it offers exciting, rewarding, and lucrative opportunities to bring their creative vision to life through games. This book also will offer game programmers a look behind the scenes of the "other side" of game development so they can better understand how game art is created and works with their own programming code. Les Pardew is a recognized leader in the world of interactive entertainment. He is a video game and entertainment industry veteran with more 20 years of industry experience. His artwork credits encompass film and video production, magazine and book illustration, and more than 100 video game titles, including numerous market-leading choices. 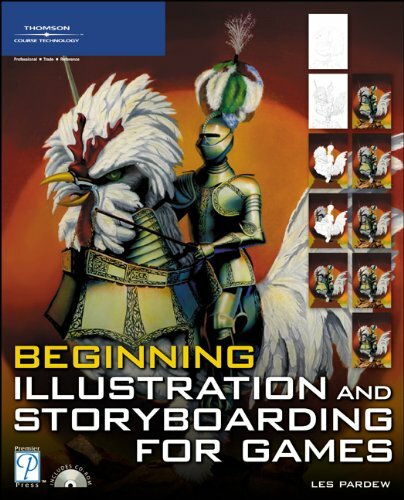 Les has also authored or co-authored 13 books on game art and game design for teens, digital art and 2D and 3D animation, drawing, and virtual models. Les started his career in video games doing animation for Magic Johnson Fast Break Basketball for the Commodore 64, He went on to help create several major games, including Robin Hood Prince of Thieves, Star Wars, Wrestle Mania, NCAA Basketball, Stanley Cup Hockey, Jack Nicklaus Golf, Where in the World/USA is Carmen Sandiego?, StarCraft Brood Wars, Rainbow Six, Cyber Tiger Woods Golf, and many others. An accomplished instructor, Les has taught numerous art and business courses, including teaching as an adjunct faculty member at Brigham Young University's Marriott School of Management. As a business leader, Les has founded two separate game development studios. He is also a favorite speaker at video game conferences and events.